For those who love the rich, luxe look of a traditional marble fireplace, but one combined with the best of modern features, the Sorrento Marble Fireplace is the perfect choice. 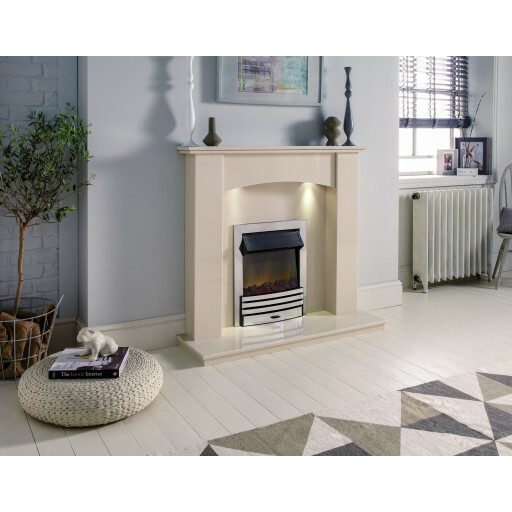 Not only does it perfectly complement the décor of any home, it has been designed and manufacturer utilising only the highest quality marble to create the perfect surround for containing any fire. The unit's curved arch resting below a bevelled double shelf and its lipped hearth are two of the Sorrento Marble Fireplace's most outstanding features. The Sorrento Marble Fireplace stands as a beautiful centrepiece for living room, study, family room or dining room. This fireplace model's two concealed downlights make for an especially dramatic presentation when the room's lights are lowered or at night. The Sorrento Marble Fireplace is certain to add beauty and warmth to any home's environment. Marble has an unparalleled elegant appearance, making it one of the most popular stones selected for creating fireplaces. Homeowners who have already installed the Sorrento Marble Fireplace within their home love that it is easy to clean and maintain, requiring only a damp washcloth to remove soot, spilled liquids or food particles. The Sorrento Marble Fireplace adds a sense of majesty to any room. Being constructed of the highest quality hard, dense stone, the Sorrento marble Fireplace is both heat and fire resistant. The marble used in its construction is renowned for its durability.